Learn how to update and use security questions to reset account password (local account) in Windows 10 V1803 or later, in this article. But if you’re on local account, there is no way to reset its password, when you forget it. In such a case, you’ll need to format the OS and make clean install of it. Doing this will remove all your stuff, and you need to setup everything again, which is painful. With Windows 10 V1803 (April 2018 Update) or later, you’ll be able to reset local account password, when you forget it. 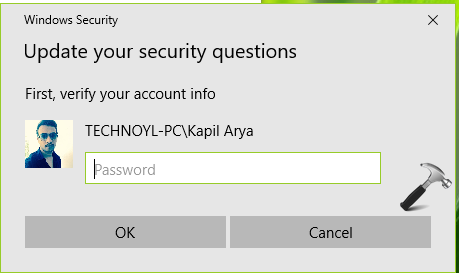 Actually Microsoft has realized the trouble of losing local account password, hence they implemented security questions feature to Windows 10 OS. Users will have to set the security questions in advance, so that they can use their answers to reset the forgotten password. PART 1 – First update your security questions for the account, in advance! 2. In the Settings app, navigate to Accounts > Sign-in options. 3. Under Family & other people, click Update your security questions. 4. Next, verify your account by providing the credentials you’re asked for. Click OK.
5. Then in the below shown window, select your own security questions and type the answers (which may be case sensitive). Click Finish. In this way, you’ve finally updated your security questions. 1. On the login screen, when you type incorrect password, a Reset password link would appear only if you’ve already updated your security questions. Click on the link. 2. Next, type in the answers for your security questions and press Enter key. 3. If your provided answers are correct, you’ll have the option to type new password and confirm it. So you can now use this newly created password to login to your account.